Portrait of Laurence de Valmy, 'connected' artist who get her inspiration from...Instagram and created her series "POST". She is now working with our gallery Kahn - London and will be showing in several cities: New York in May as well as Hong Kong, in Munich at the MUCA: the very first museum showing Contemporary & Urban art in Germany. We want to share with you moments of the French artist's typical week. Every morning I look up on social media so I can be on top of what's going on in Europe. I post on Instagram 3-5 times a week: about an on-going project, about a paintings and the story behind it, or a snapshot from my studio. On facebook I like to read some infos and on Instagram it is more to meet new contacts, artists or galleries: I have met Kahn through Instagram! 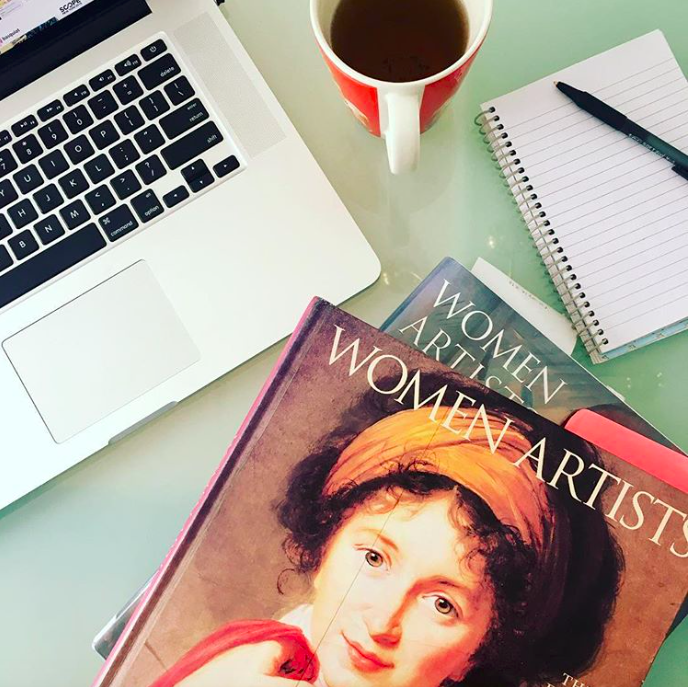 Working on new Posts paintings about women artists. So inspiring to read about these pioneers. I do several break during my day to catch up with my community and talk about my upcoming shows. Social medias are definitively the best way to do that. I am sending newsletter from time to time as one might not be on Facebook or Instagram. Art is more and more enjoyable through our screens but the best way to enjoy it is in real during a show. It is the occasion to gather up with friends or to meet up collectors. Delire de l'Art, is a french blog about contemporary art directed by Alexia Guggémos. She wrote "L'Histoire de l'art pour les nullissimes", or "History of art for dummies". She is curator at the Art Smiles Museum, and writes columns about art. A 2.0 and uninhibited way of art criticism.